A military plane crash in Spain was probably caused by computer files being accidentally wiped from three of its engines, according to investigators. Plane-maker Airbus discovered anomalies in the A400M’s data logs after the crash, suggesting a software fault. And it has now emerged that Spanish investigators suspect files needed to interpret its engine readings had been deleted by mistake. This would have caused the affected propellers to spin too slowly. 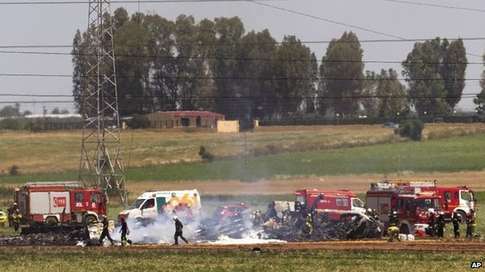 The aeroplane crashed near Seville during a test flight on 9 May, killing four crew members on board. Several countries that had already accepted deliveries of the plane – including the UK – grounded them following the accident. However, Airbus has announced it plans to fly one of its own A400M aircraft at the Paris Air Show next week. It said the focus of the inquiry was a theory that files known as “torque calibration parameters” had been accidentally deleted during a software installation process ahead of the plane’s first flight. BBC NEWS reported. The control systems of the A400M aircraft are heavily automated. Each engine is run by a separate computer called an Electronic Control Unit. The ECUs take the pilot’s inputs and make the engines they control respond in the optimum way. The parameter files are used by the ECUs to interpret sensor readings about the turning force generated by each engine – the torque – which is used to make the attached propellers spin. Without the files, the ECUs cannot make sense of this data. This would explain why three of the plane’s four engines did not respond properly to the crew’s attempts to adjust their power settings shortly after take-off. Airbus has already confirmed that its pilots had tried switching the malfunctioning engines into “flight idle” mode – their lowest power setting – in an attempt to tackle the problem. Without the parameter files, the engines would have been left stuck in this mode. This is because the planes were deliberately designed to prevent out-of-control engines powering back up to avoid them causing other problems. It was not foreseen that three propellers would be affected simultaneously, making it impossible to keep the plane airborne. “We are working closely with the official investigation and we will act in accordance with the information that is discovered but we are not able to discuss the findings,” a spokesman for Airbus said. Spain’s Ministry of Defence, which is leading the investigation, has said it is not permitted to discuss the matter. Spokesman of European Aviation Safety Agency confirmed it had sent an unpublished directive to A400M buyers, but declined further comment. Reports Reuters. Government takes fault in Cashless fare system failure.